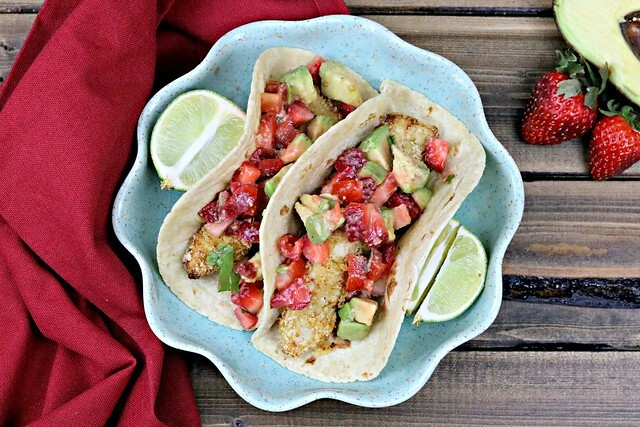 Crispy breaded chicken marinated with all the flavors of your favorite margarita, wrapped up in a taco topped with strawberry-avocado salsa. Is that summer on a plate, or what?? I believe this was the first taco recipe I ever posted on the blog, back in 2011. I had just discovered the blog How Sweet It Is, and I was making her recipes as fast as I could get them on the menu. Six years later, I’m still loving her recipes! I mean, strawberry-avocado salsa? Yum. I know some people are divided on the whole, mixing fruit with savory dishes thing, but…it’s pretty amazing. 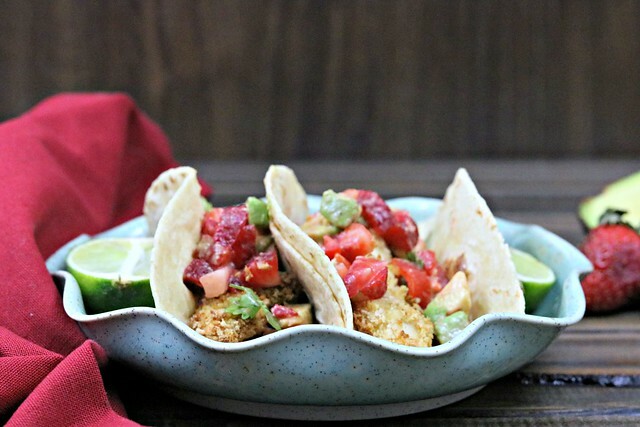 The chicken is marinated in tequila and lime juice, then breaded and baked to crispy perfection. 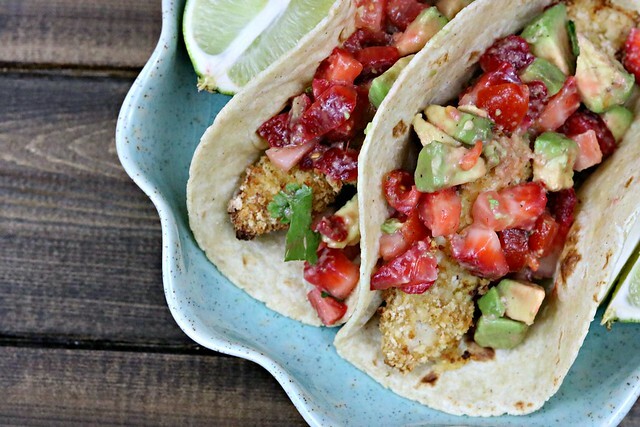 Wrap that up in a warm tortilla and top with the strawberry-avocado salsa and you have dinner perfection! I remember really loving this taco the first time I made it, but it seemed even better this time around. Perhaps it’s as simple as time. 6 years is a good bit of time. To change, to grow, to appreciate things (like, food) more and more. I’d like to believe that I have grown as a person and a cook over all that time. And while the recipe remains the same, sometimes the method and care of preparation can change over time. Having a family to care for and feed might have a little something to do with that, as well. So, while the taco has always been a good one – as are so many recipes on Jessica’s blog – it tasted just a little bit sweeter this time. 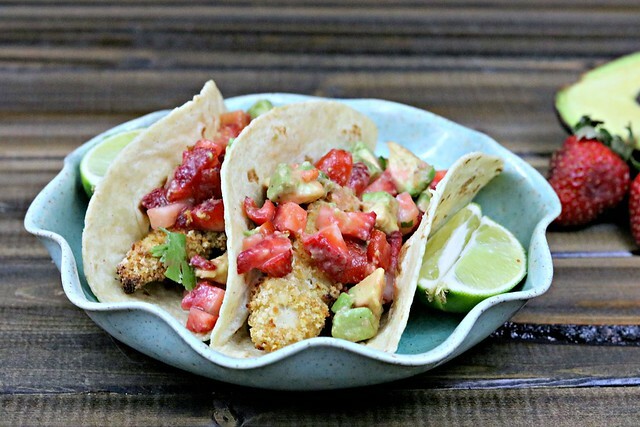 So, don’t miss out on this perfect-for-summer taco! The recipe can easily be doubled (or more!) for a larger crowd. Combine oil, tequila, lime juice, lime zest, and coriander in a baking dish. Season chicken with salt and pepper, then slice into strips lengthwise. Add the chicken to the marinade, cover and put in the fridge until ready to make. Preheat oven to 450 degrees F. Combine panko, flour, lime zest and coriander in a bowl. Lay a wire rack on a baking sheet and spray with non-stick spray. Remove chicken from marinade and coat strips in panko mixture, pressing so the crumbs stick. Lay them on the baking sheet then give them a quick spray of non-stick spray. Bake for 10 minutes, flip, then bake 10 more. 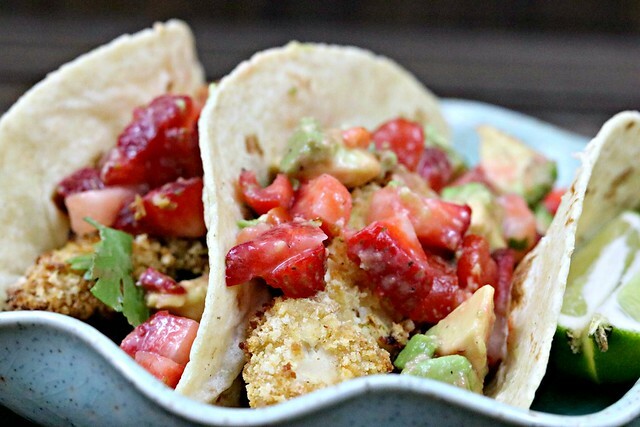 While chicken is cooking, combine avocado, tomato, and strawberries and cilantro. Mix with salt, pepper and lime juice. Heat tortillas if desired, then serve with crisp chicken, salsa, and toppings of your choice (cheese, lettuce, etc). « Natalie Grace: 9 months…already? ?